Jumping out to a 3-0 lead in the first game, Hart girls volleyball looked to stay undefeated in league play as they hosted Canyon in its second Foothill League match of the season on Tuesday. Sweeping the Cowboys 25-18, 25-10, 25-13, the Indians (6-1 overall, 2-0 in Foothill League) stayed undefeated in Foothill League play and have yet to drop a set in the two league matches so far. “Our performance was great because it was consistent,” said Hart head coach Mary Irilian. “Often times we have had some dips, so it was nice to actually see them in control the whole time and they did their job.” For most of the first game, Hart and Canyon (10-7, 1-2) traded points with Megan Soto, Noelle Blumel and Shelby Grubbs heading the Indian attack, while Sasha Thomas-Oakley and Kyra Titner doing the same for the Cowboys. After Blumel recorded her second ace of the game and a Soto kill, Canyon’s coach Robert Treahy was forced to call a timeout with his team down 20-16. The Cowboys were able to regroup and take the point coming out of the timeout but fell 25-18 after Grubbs hammered home the game-winning point. Beginning the second set the same way as the first game, Hart jumped out to a 5-0 lead behind Soto’s kills and CJ Catabona’s back-to-back aces. “I’m pretty proud with how I did, especially because at practice yesterday I struggled a little bit. So today I’m really proud of how I played,” Soto said. “And I kept telling Kylie (Mattson) to keep setting me because I was feeling really good.” Soto finished the night with 20 kills. Allowing Canyon to get back into the game, it seemed like every point that was scored by the Cowboys was because of an Indian mistake or service error. Canyon’s Ariana Vargas and Laska Stanford tried to spearhead the Cowboy offense with clean, precise passes, but the deficit was too much, forcing Treahy to call another timeout down 16-8. “It’s funny because it’s a lot of practice this year,” Blumel, who had 10 digs, said. “Every practice we come in and we serve a specific area and if we miss it we have to do five pushups and that has really whipped us into shape and it shows in the game.” Hart took the second game scoring nine of the last 11 points to win 25-10. Looking like a well-oiled machine, the Indians skill and depth shined through in the third and final set of the match as Mattson found Soto, Grubbs and Zoe DiNardo time and time again for the kill. “They make me look good, that’s for sure,” Mattson said. “I knew that we could do it because I’m so confident that if I put up a ball they will slam it down and that’s what they did. I mean, you don’t go into games super-cocky-confident, but I know with them in we can do great things because they are great hitters.” Taking the third set 25-13, Hart completed the sweep of the Cowboys to stay perfect in league play. DiNardo finished the day with 10 kills, Grubbs finished with nine kills and chipped in five blocks and Mattson ended the day with 33 assists. “They didn’t make too many mistakes and that was the difference,” Treahy said. 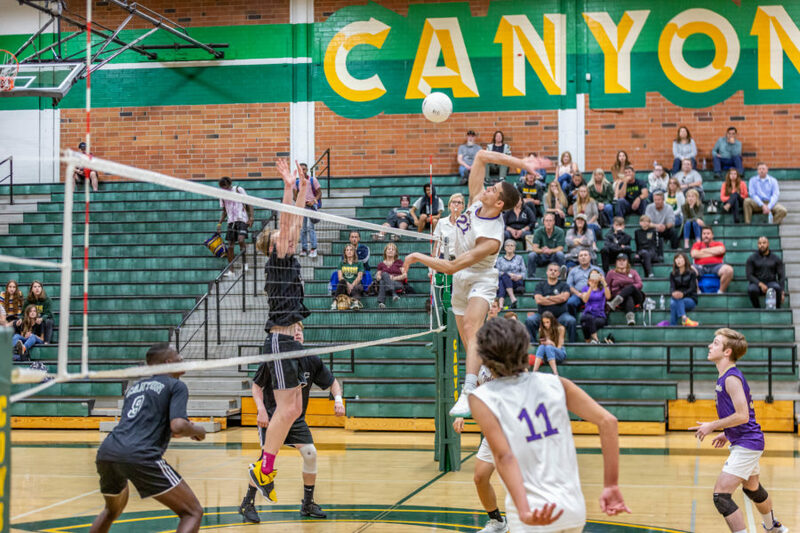 “We need to go back to basics and fundamentals and we have to keep our fingers crossed.” Both teams will be in action again on Thursday with Canyon traveling to Golden Valley and Hart hosting West Ranch. Both games are set to start at 5:30 p.m.
Saugus hosted Golden Valley and came away with the win in four games: 25-22, 16-25, 26-24, 25-23 on Tuesday. Taking the first game 25-22, the Centurions dropped the second game 25-16 to allow the Grizzlies (7-5, 0-2) to get back into the game. Playing it close the rest of the way, the Cents and Grizzlies battled with Saugus, ultimately coming away with third and fourth set wins by a combined four points. “We played good enough to win,” said Saugus girls volleyball coach Zach Ambrose. “I think we could have played better, but they did some very good things. They were scrappy and they put a lot of pressure on us. We made a lot of unforced errors but in the end we came with it.” Saugus’ Kayla Tait finished the game with 23 kills and 15 digs. Amira Fann handed out 22 assists to go with four blocks, Brianna Plunk had nine kills and five blocks and Rhiannon Body chipped in 24 digs in the win. Saugus’ next game is at Valencia, while Golden Valley will travel to Canyon to try and capture its first Foothill League win. Both games are scheduled for 5:30 p.m. on Thursday. The Santa Clarita Christian School girls volleyball team traveled to Acton and came away with a sweep of the Mustangs on Tuesday. Winning with scores of 25-14, 25-11, 25-4, SCCS (3-2 overall, 2-1 in Heritage League) have not dropped a game in two straight league matches after sweeping Lancaster Baptist last Thursday. The Cardinals play The Palmdale Aerospace Academy at The Palmdale Aerospace Academy at 5 p.m. on Thursday. Trinity Classical Academy girls volleyball team moved to 9-3-1 with its victory over The Palmdale Aerospace Academy on Tuesday evening. The Knights won convincingly, 25-21, 25-18 and 25-16 behind strong performances from Nicole Amoroso, Hannah Caddow and Heidi Schafer. Amoroso recorded 27 assists, Shafer added 10 digs and Caddow had 11 kills, four aces and ten-plus digs. Trinity faces Faith Baptist on Thursday at 4 p.m. at the Henry Mayo Fitness Center.